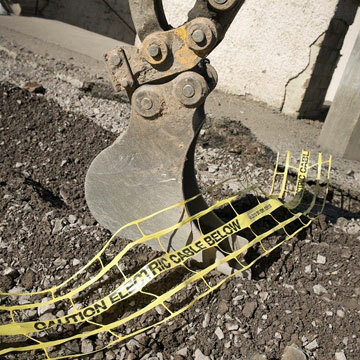 Construction tapes are a versatile and invaluable part of the building industry, whether you are joining electrical cable or warning future groundworkers about services buried below they are a vital tool of the trade. As well as making sure you are compliant with legislation, choosing the right tape ensures joints are sealed correctly, service pipes are protected and the job gets a professional finish. 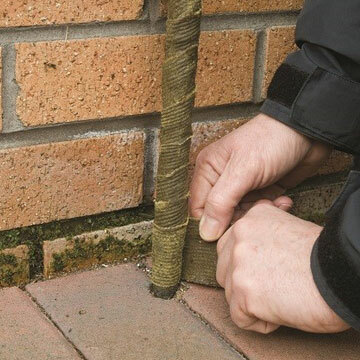 Whether you are looking for a basic duct tape or a specialist barrier tape Civils and Lintels can help. At Civils and Lintels we work with Bruce Douglas Marketing to provide a comprehensive range of premium quality adhesive and warning tapes. Our range of tapes include, double and single sided jointing tapes, electrical tape, barrier tapes and warning tapes. Single Sided Jointing Tape – This is a premium quality, electrical, self-extinguishing PVC tape with a rubber adhesive. Typical applications include Insulation, colour coding and for electrical cable wrapping in automotive applications. Wider rolls of 50mm, 75mm and 100mm are commonly used for lap jointing of DPM Membranes and general jointing of materials in roofing and cladding. Benefits of this tape include good resistance to abrasion, corrosion and moisture, high dielectric strength and excellent conformability. This tape is manufactured to meet BS EN 60454-3-12:2006, IEC 62321:2008 and UL510 certificated (Flame retardant). Double Sided Jointing Tape – We can also offer a double sided jointing tape most suitable for use in roofing and cladding where it creates an excellent seal in situations such as side and end lap joints, heating and ventilation and damp proofing. Benefits of this tape include its instant seal, high pumping resistance, solvent free formula, nontoxic and cost effectiveness. Detectable Underground Warning Tape – This tape is manufactured to BS EN 12613 standard, from a Polypropylene mesh with a 30mm wide band printed with a warning message. It is most suitable for use underground to provide a visual warning that a buried pipe, cable or other service is below. Incorporated In this tape is a 0.5mm tracer wire, used with underground utilities locators that are of non-metallic materials. Non-Adhesive Barrier Tape – This tape is a LDPE film with either Red and White chevrons or Black and Yellow chevrons used to cordon off danger areas. Common industries this tape is used in include construction sites, factories, warehouse, emergency services and many other situations where safety of personnel is a priority. This tape is manufactured from 70% recycled plastic and benefits include high visibility chevrons and water and weatherproofing. Petro Tape – This tape is manufactured from a polyester fabric carrier coated and fully impregnated with a homogeneous blend of petrolatum and inert mineral fillers. This process means it is resistant to mineral acids, alkalis, and salts and bacterial attack and remain flexible and highly impermeable to water vapour. Benefits of this tape include its long-lasting protection, conformity to any surface, its resistance to dilute Mineral Acids, Alkalis and Salts and its ease to repair or replace after inspection. It is suitable for use in oil, gas, water and waste pipelines, buried and exposed pipework, valves, couplings, flanges and flange adaptors and structural steelwork. If you are looking for construction tapes to complete your project, contact your local branch.